S.Ivanov. The supertournament in Sofia: no compromise and struggle evasion! A considered game is interesting above all for its psychological implication. There were two uncompromising grandmasters, who make beauty and aesthetics of chess a cornerstone of their styles. Emil Sutovsky is a unique phenomenon in the chess of the XXI century, he is like Morphy, Alekhine and Tal – "all-in-one". Emil tore to pieces a new section "the best games of the month" with his recent brilliant victories and I would say he "raised a dust" among grandmasters and masters. Even more pressure and aggression could be expected from Emil in his encounter with Ivan Sokolov, who plays himself and lets his opponent play. In his turn Ivan is known as Sheriff's killer in the chess world – it is sufficient to remember Garry Kasparov`s crushing defeat in Wijk aan Zee in 1999 that cut off a triumphal series of the world champion, who was in his best shape. So, it`s possible to imagine how Ivan was provoking Emil in his mind: «Come on, attack, sacrifice, invent combinations, I`m not afraid, I`ve been through worse...» A reader can find out how things turned out and who won this battle from the game cited below. 1.e4 e5 2.¤f3 ¤c6 3.Ґb5 a6 4.Ґa4 ¤f6 5.0–0 ¤xe4. The Open Spanish has been serving Ivan Sokolov faithfully for many years, so no wonder that he unsheathed a battle-tested weapon for this principled encounter. 6.d4 b5 7.Ґb3 d5 8.dxe5 Ґe6 9.¤bd2. Another fashionable branch - 9.Ґe3, it`s obvious that 9...Ґe7 10.c3 ¤c5 11.Ґc2 ¤d7!? should be revaluated in the immediate future. Black intends to capture e5 pawn without a twinge of conscience, even if spending some precious tempi. It`s known from practical experience that White has better chances in case of other continuations. 12.¦e1 ¤dxe5 13.¤xe5 ¤xe5 14.Ґd4 ¤c6! (stronger than14...¤g6 15.Ґxg7 ¦g8 16.Ґxg6 ¦xg7 17.¦xe6 hxg6 18.¦e5 c6 19.¤d2І) 15.Ґxg7 ¦g8 16.Јh5 (or 16.Ґh6 Ґc5 17.Јf3 Јh4 18.Ґf4 (Acs – Korchnoi, Hungary 2005) 18...0–0–0ѓ) 16...ўd7 17.Ґh6 Ґc5! A natural and logical move and important novelty at the same time. Queen moves on f6 then, rooks double along "g"-file – it turns out that Black does not have to defend himself, he can counterattack! After 18.¤d2 Јf6 19.¤f3 (safer is 19.Ґe3) 19...¦g4! 20.ўh1 ¦ag8і. 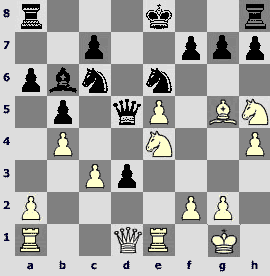 White's kingside is under a strong pressure (Kotronias – Motylev, Moscow 2005). By the way, it was only the second experience of Motylev with the Open Variation, and it turned out to be successful again (the first one was a victory over Peter Svidler in the superfinal of Russia-2004). Grandmasters, do not hesitate to play new, unhackneyed schemes, the theory is waiting for your discoveries! 9...¤c5 10.c3 Ґg4. The most reliable continuation. Popular 10...d4 could also be frequently seen in Sokolov`s games, however in this one he probably did not want to pick up a puzzling difficulties that White can cause by 11.¤g5!? Besides, in the recent encounter Svidler – Sokolov (Vijk aan Zee 2005) Black ran into serious difficulties after 11.Ґxe6 ¤xe6 12.cxd4 ¤cxd4 13.a4 Ґb4 14.axb5 ¤xb5 15.Јa4 Ґe7 16.¤e4 0–0 17.¦d1 Јc8 18.Ґg5±. And it was Sutovsky who had afterglow of the variation 10...Ґe7 11.Ґc2 d4 12.¤b3 d3 13.¤xc5 dxc2 14.Јxd8+ ¦xd8 15.¤xe6 fxe6 16.Ґe3 ¦d5 17.¦fc1 ¤xe5 18.¤xe5 ¦xe5 19.¦xc2 ўf7 20.c4! b4 21.¦d1 ¦d8 22.¦xd8 Ґxd8 23.ўf1 Ґg5 24.Ґa7!! (it`s extremely important to prevent the bishop`s exchange) 24...Ґe7 25.¦e2 ¦f5 26.Ґe3! h5 27.g3 g5 28.h3 Ґd6 29.g4 hxg4 30.hxg4 ¦a5 31.b3, and Emil skillfully brought his minimal advantage in the ending to the win (Sutovsky – Sorokin, Dagomys 2005), having proved that he is on firm ground in simple positions as well. 11.Ґc2 ¤e6. Quite a rare continuation. Black`s idea is to develop a dark-squared bishop not on e7 but more actively – on c5. But the bishop turns out to be vulnerable on this square and can be attacked (as Emil Sutovsky noticed keenly later). However, there hasn`t been anything unexpected yet – Sokolov has already had this move in his practice. The mainlineis11...Ґe7 and 11...Јd7. 12.¦e1. Inclusion of moves 12.h3 Ґh5 probably plays into the hands of Black as light-squared bishops` exchange by Ґg4-h5-g6 was planned. 12...Ґc5. Black got the desired setup. 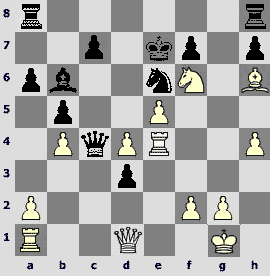 In case of 12...Јd7 it`s possible for White not to let the bishop on c5 – 13.¤b3! ?, for example: 13...¦d8 14.a4 Ґe7 15.axb5 axb5 16.h3 Ґh5 17.Ґd3 ¦b8 18.Ґf5 0–0 19.Јd3 Ґg6 20.Ґxg6 hxg6 21.Ґe3І Vasileciu – Racanu, Bucharest 1999. 13.¤f1. White intended to play ¤g3, h3, make Black exchange a bishop for a knight to have the kingside at his disposal. Another plan is essentially linked with the queenside play: 13.¤b3 Ґa7 14.a4 (14.Ґe3 ¤e7 15.Ґxa7 ¦xa7›) 14...b4 15.Јd3 Ґh5 16.¤fd4 Ґxd4 17.cxd4 Ґg6 18.Јd1 Ґxc2 19.Јxc2 ¤cxd4 20.¤xd4 ¤xd4 21.Јc5 ¤e6 22.Јc6+ ўe7 23.Ґe3 d4 (Lutz – Jusupov, Germany 1996) 24.Ґd2!? a5 25.f4ѓ. 13...Ґh5. Everything runs logical and according to a plan. However Sutovsky managed to question a natural development of the game by his drastic and non-typical actions. Thereupon it makes sense for Black`s position admirers to pay attention to another, not that straightforward attempt: 13...¤e7!? Black takes control over f5 in advance, and an obvious answer 14.¤g3 is met by emphatic 14...h5! Thus Black avoids unfavorable exchange of the light-squared bishop. The struggle can develop the following way: 15.h3 h4 16.¤f1 Ґh5 (Adams` suggestion is also interesting 16...Ґf5!?) 17.a4 b4 18.a5, fixing a pawn on a6 and clearing e4 for the rook`s maneuver. 18...bxc3 (In Adams` opinion stronger is 18...d4!? 19.Ґe4 ¦b8) 19.bxc3 Јb8 20.¦a4! An ideal place for the queen`s rook – important squares at the 4th rank are taken over the control and h4 pawn is attacked. 20...Јa7 21.Ґe3. There was the same position in the game Adams – Sokolov (Sarajevo 2000). Black got quite good chances to equalize by playing 21...Ґxf3 22.Јxf3 c6 instead of pseudo active attack 21...g5?! . It`s possible that Ivan Sokolov didn`t like something in these variations and he decided to take a more natural path. A surprise was waiting for him here as well. An interesting novelty. Sutovsky, who fairly believed that White`s chances are mostly connected with activating at the kingside, is not afraid that pawn weaknesses will arise in his camp – for the sake of drawing one of the most important pieces of the opponent away from the defense of his own king. c) And, finally, to provoke the exchange - 15.h4!? Not very good is 15...0–0? because of 16.Ґb3! - the bishop suddenly avoids the exchange, d5 pawn is hanging and there is a danger of a fatal h4-h5. After the forced 16...h6 17.h5 Ґh7 White gets a considerable advantage by simple 18.Ґxd5 Јe8 19.Ґe4 Ґxe4 20.¤xe4 ¦d8 21.Јc2 Ґe7 22.¤g3 (Almasi – Yusupov, Ubeda 1997). However a preliminary exchange of bishops - 15...Ґc2 16.Јc2 0–0 allows Black to hope for equalization. Sutovsky`s move brings a whiff of fresh air into the White's play. 14...Ґb6. Black does not have any particular choice, as we remember e7 square is meant for the knight in this scheme: 14...Ґe7?! 15.a4! 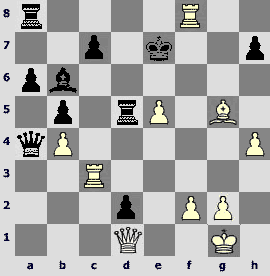 ¦b8 16.axb5 axb5 17.¦a6 Јd7 18.¤e3 with a serious initiative to White. 15.¤g3. Now White does not get anything special in case of15.a4 ¤e7 16.Јe2 c6. 15...Ґg6 16.h4. For the time being White acts according to the same line that was described in the comments of the 14th. It`s interesting to observe the difference. 16...d4. 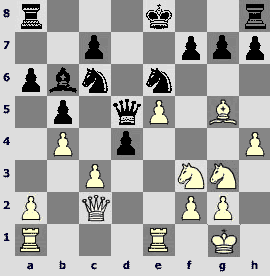 Ivan Sokolov adheres to himself and his principles – since the opponent made a weakness he should be called down immediately by the breakthrough in the center. A more cautious player would prefer16...Ґxc2 17.Јxc2 0–0 and ask his opponent: into whose hands plays the inclusion of b4 andҐb6 ? However I think White would have found a proper answer, pawn structure calcification is still in their favour in this situation. Combining the K-side and Q-side play 18.a4 Јd7 19.¤h5!? ўh8 20.Ґg5 – White in my opinion can count on developing the initiative. 17.Ґg5!? Pawns exchange on d4 would be convenient for Black, as it leads to exchanging a pair of minor pieces, and there is nothing to be afraid of after that. In general Black`s position looks quite strong and safe (only the king is to be driven away from the center for the entire happiness) and White should constantly attack something and to create some specific threats to impair it. In this connection 17.h5 is weaker (the h5 square can be of use for the knight!) 17...Ґxc2 18.Јxc2 – now Black has time to play 18...d3!, this pawn can turn out to be very strong afterwards. Possible is 19.Јb3 h6!? (less promising is 19...Јd7 20.h6 0–0–0 21.a4ѓ) 20.a4 0–0 21.axb5 axb5 22.¦xa8 Јxa8 23.Јd5 ¦d8 24.Јxb5 Јa2 25.¤d2 (after 25.Ґd2?? ¤a7! the queen is suddenly captured) 25...¤e7, and Black has quite a good compensation for the lost pawn. 17...Ґxc2. It`s obvious that it`s a dream of White to kick out Black's hope and prop – the e6-knight. In case of 17...¤g5? 18.¤g5 the position of Black would become dangerous all of a heap. Also bad is 17...Јd5? 18.Ґb3, so the exchange of the light-squared bishops is forced. All right then we can sum up an opening. At first glance, the position of Black looks fine (it`s difficult to believe that in four moves it will become hopeless). Black queen is on a dominant position in the center and it`s not clear how to drive it away from here. Black knights are excellently placed, especially a beautiful blocker on e6. I think that Ivan Sokolov was satisfied with his position by that moment and was thinking about the possibility to regain the initiative. However, as everybody knows there are not only rules but also exceptions in chess, and this position is rather among such exceptions. Emil Sutovsky managed to find a way to outflank the centralized group of black pieces and to develop a killing attack in just a few moves. Despite all there are two more important details in the position: black king has not castled yet and black bishop is moved to a flank (let`s remember 14.b4!?) and can not take part in the play on the opposite side of the board yet. 19.¤h5! A prelude to the coming combinational outburst. 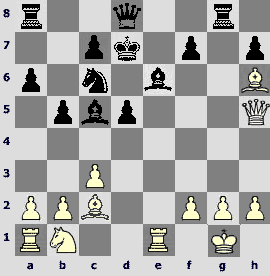 h5 is the best place for the knight, it`s very important that white pawn was not placed here a few moves ago. 19...Јc4. It`s high time to castle, but it`s obvious that Black did not want to let the bishop`s invasion onf6 – 19...0–0 20.Ґf6! So, the question rises, does White have any threats here? 20.¤d2! Another brilliant decision that to all appearances was not taken into consideration by Black. However, I think that Emil did not even consider a shy 20.Ґd2 0–0 etc. 20...d3? The only considerable mistake in the game turns out to be decisive for Black. Why not just to capture a pawn - 20...Јxc3 ? Now in case of 21.Јe4 ? there is a response 21...¤xg5 22.hxg5 (22.¤xg7+ ўf8 23.Јf4 ¤h3+! 24.gxh3 ¦g8µ gives nothing)22...0–0 (also possible is 22...0–0–0) 23.¤f3 ¤xb4, and the play is unclear. It turns out that White has prepared a knockout blow – 21.¤xg7+! 21...¤xg7 22.Јe4. White does not grudge a piece to draw the black knight away from e6 at least for a while! However a piece is regained immediately and after the forced 22...0–0 23.¦ac1 Јxb4 24.¦xc6 ¦ae8 25.¤f3ќWhite attacks the black king with all his might. The only way to continue the struggle was 20...Јd5 21.¤e4 Јc4! It`s necessary for Black to keep a possibility of pawn exchange on c3 to provide d4 square for his pieces. 21.Јd1 Јd5. In case of 21...Јxc3 22.¦c1 Јd4 White delivers already known to us repulsive blow – 23.¤xg7+! 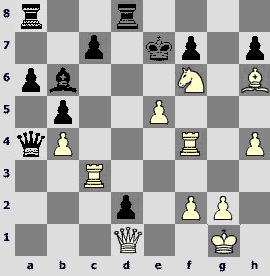 (Black`s plan could be based on 23.Јf3 Јxf2+! 24.Јxf2 Ґxf2+ 25.ўxf2 ¤xb4, and his ending is not worse anyhow)23...¤xg7 24.¦xc6 Јxf2+ 25.ўh1, for example: 25...¤f5 26.¤e4 ¤g3+ 27.¤xg3 Јxg3 28.¦xb6! cxb6 29.¦e3 Јf2 30.¦xd3 0–0 31.Ґf6ќwith decisive threats. So, only four moves have been made, but Black will already appreciate a piece of good advice. 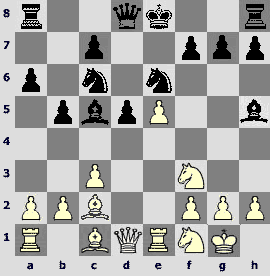 White knights are in absolute concord and it`s not clear how to defend against a check on f6. Eh, it would be nice for Black to have his bishop somewhere around e7, but alas, alas!.. 22...ўf8. It seems to be the only defense, but it does not save. 23.¤ef6! Anyway! It`s easy and pleasant to find such moves. 23...gxf6 24.¤xf6. Here comes a result: a perfect centralized black queen is almost captured. 24...Јc4. The main point for White in case of 24...Јd8 is not to sell too cheap; so, there is no point in winning the queen: 25.¤h7 ¦h7 26.Ґd8 ¦d8, and Black can still show a stubborn resistance. Much more effective is 25.Ґh6+ ўe7 (25...¤g7 26.Јg4) 26.Јf3 d2 27.Јxc6 dxe1Ј+ 28.¦xe1, and there is no protection against the threat ¤d5. 25.¦e4 ¤cd4. A piece is to be returned, after25...Јxc3 26.Ґh6+ ¤g7 27.¦c1 Јb2 28.Јg4 a mate to the black king is not far off. The main difficulty for White is to choose the optimal continuation of all winning ones. 27...¤xd4 28.¦c1 Јxa2. There was a chance to get a merciful release much earlier: 28...¤e2+ 29.¦xe2 dxe2 30.Јd7#. 29.¦xd4. All white pieces are attacking, besides, he already has a material advantage. It`s time to drop the curtain. 29...¦hd8. The rook is inviolable: 29...Ґxd4 30.¦xc7+ ўe6 (30...ўd8 31.¦d7+ ўc8 32.¦xd4) 31.Јg4+ ўxe5 32.¦e7+ ўxf6 33.Јg5#. 30.¦f4 d2 31.¦c3. One can take false step a step close to a win - 31.¦c2?? Јxc2. Thank goodness, White has a perpetual check: 32.¤g8+ ўe8 33.¤f6+. To calm down White repeats moves - – 32.¤g8+ ўe8 (objectively stronger is certainly 32...¦xg8 33.Јxd2, but the position is hopeless anyway) 33.¤f6+ ўe7, and delivers a decisive blow: 34.¤d5+! ¦xd5 35.¦xf7+! Uncomplicated and elegant combination. A chessplayer who consults a computer would announce his opponent: "You are getting mated in 8!" 35...ўd8 [35...ўxf7 36.Јf3+ ўe8 37.Јf8+ ўd7 38.Јf5+ ўd8 39.Ґg5+ ўe8 40.Јe6+ ўf8 41.Ґh6#] 36.¦f8+ ўe7 37.Ґg5+! 1–0. After37...ўf8 38.Јf3 ўe8 39.Јh5 ўd7 40.Јg4 there is no escape from the mate, that's why Black resigned (we will note that black bishop remained on b6 observing his king's massacre from afar). So, the fate of the game was decided between the moves 14th and 20th. It`s interesting that Sutovsky did not sacrifice anything during this period, but systematically regrouped his pieces and only when he completed this there was a combinational outburst. It`s possible to say that he benetted Sokolov, lulled him, acting in a manner quite unusual for him and leaving Ivan no scope. Well, one must admit that this game revealed new undiscovered before features of Emil Sutovsky`s many-faceted talent. Keep that up, Emil!